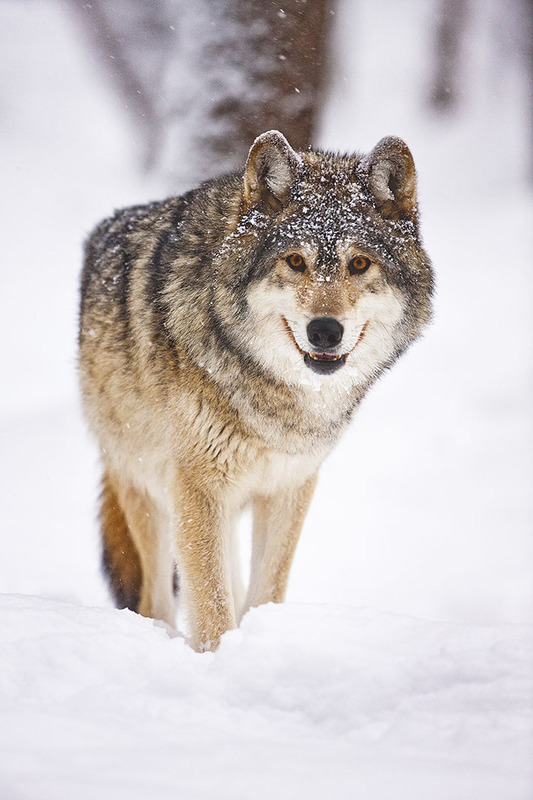 The remarkable Grey Wolf (Canis lupus), is a creature that is feared, revered and beloved in legend, myth and reality. They have acute senses that allow them to easily survive and thrive in the harsh wilderness. Their sense of smell is thought to be almost 100 times more sensitive that a human's, while their hearing is four to five times better than ours. And though their eyesight isn't "super human," it is equally as good as ours. In this image, an apparently lone wolf stands in the frigid temperatures in Yellowstone National Park on a very early morning, assessing its surroundings. The falling snow and icy landscape don't seem to affect this beautiful animal, except to show a dramatic contrast between its stunning gaze and the colorless backdrop of winter.